The routes from Norwich to Yarmouth and Lowestoft to the East of Whitlingham Junction are controlled from a series of nine mechanical signal boxes, and four manned crossings. Four of the signal boxes have had some life extension work in the last few years, but will need further renewals principally of signal structures in the near future. The remaining 5 signal boxes have had no work since the late 1970s or early 1980s apart from the fitting of AWS and removal of the pole route. The area is expensive to operate due to the 13 staffed locations. Life extension work is needed on most of the signal boxes within the next 5 years and there is there is considerable scope for track rationalisation at 4 of the signal boxes. Network Rail decided after considering the many factors that a re-signalling rather than a life extension of the area would give better long term value in terms of operational cost as well as improving reliability and safety. Processing of Asset GPS Data capture from the previous phase of the project. Signal Sighting using the Gioconda modelling tool and HD Video from the previous phase of the project. Accurate coverage of the re-signalling geographical area plus reasonable distance beyond to cover fringes. Overall metrerages/ mileages associated with the re-signalling geographical area, are to be verified by utilising diverse and reliable methods and any significant anomaly to be highlighted for immediate discussions. Verification methods such as verification of asset/equipment counts against the supplied signalling/track drawings/civil drawings are to be used in addition to the verification process that Gioconda has in place. Pictorially and dimensionally accurate signal elements in accordance with Railway Group Standard, GK/RT0045 (main signals, junction indicators, subsidiary signals etc). Pictorially and dimensionally accurate signage in accordance with Railway Group Standard, GI/RT7033 (Permissible speed Indicators, Warning boards etc). Signals and signage accurately located longitudinally, laterally and vertically within the Giaconda model, the exact accuracy to be jointly determined. 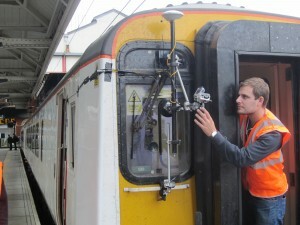 All signals visible to a driver are to be shown within the model including signals on the track travelled, adjacent lines and signals in the other direction (back of signals). Existing signals are to be retained within the model with a facility to toggle between existing and new signals. Realistically moveable obstructions such as vegetation and existing signals to be made transparent (i.e. signal aspect can be seen) when new signals are in view.